Can you believe that just a week ago we had snow on the ground, freezing temperatures and darkness? Seems a long time ago as now the clocks have changed to herald British Summer Time and we have sunshine and lighter evenings… and a busy weekend for members of the club to boot. Starting with Parkrun. At Frimley Lodge it was a big Day for Jim Casey who completed his 200th Parkrun. More from him later in the week. Blanche Barnes bagged another PB with her fastest at Frimley in 28:41 while Clive Rolfe was the first to finish. Bracknell again attracted the most members with twelve in action on a muddy course. Krzysztof Zielinski carried his great run of form into his first attenpt at the venue. 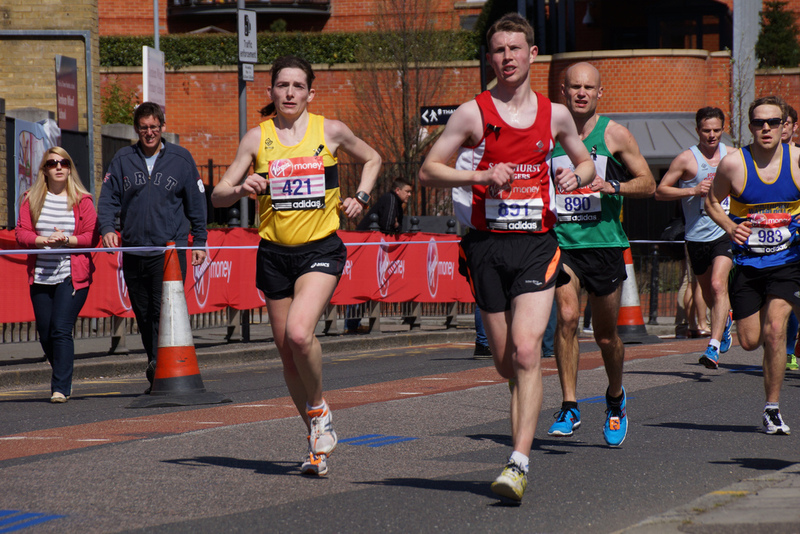 Richard Jackson recorded a PB with 29:13. Rushmoor regular Helen Vizard was first member over the line after two laps of the Queens Parade course. This week also saw the return of Jenna and Kim Soane. On the Parkrun Tourism front Stuart Overhill grabbed 12th at Bedfont Lakes, John Paul Featherstone was in action at Newbury for the first time since 2016 and Anne and Simon Whillis returned to the brilliantly named Rising Sun Parkrun (it’s in the North East of England rather than the ‘Far East’). Lisa Hale sampled the new Mole Valley Parkrun at Denbies. Six members navigated the challenging travel logistics to get to the Big Smoke in time for the new London Landmarks Half Marathon. There were a string of great results… Heidi Zymela (1:43:32), Claire Hobson (1:56:08), Angela Foker (2:37:05), Lucy Murphy (2:22:43), Katie Woolger (2:49:09) and Pam Whelan (2:11:08). A great event topped off with medals presented by Pearly Kings and Queens. Full results from the Cranleigh 15/21 aren’t available yet but Paul Biggs, Lisa Hale, Fern Stonestreet, and Stuart Overhill were in action so we’ll have more on this later in the week. No times from the Dorney Lake Marathon Prep event yet but Matt Johnson ran 20 miles and Monica Burbidge completed 16. Jacq Hudson pulled up with a injury and her sensible approach stopped it getting worse. A new format for the Canal Run simplified logistics with runners starting at Frimley Lodge and heading out along the Basingstoke Canal to turnpoints at 5, 7.5 and 10 miles (and there was nothing to stop tweaks to those to fit individual need or even a lap of the Rushmoor and Frimley Lodge Parkrun courses). A team of supporters was ready at the five mile point with welcoming smiles, water, jelly babies and flapjacks and they were kept busy with thirty seven members taking part in the run! Finally Alison Jones tackled the huge Jurassic Coast Challenge; a three day Ultra with 28 miles on Friday, 30 on Saturday and 29 on Sunday. We’ll have a full report on this as soon as Alison’s leg’s start working! Well done on an amazing physical and mental achievement! Tuesday Club Run: The Triumvirate of Tuesday General members Monica Burbidge, Dave Bartlett and Royston Crandley will be looking after the biggest club run of the week. As always there will be multiple groups to cater for all abilities from beginners through to faster and more experienced runners. It’s perfect for novices and those coming back from injury or a long lay-off because you can start with an easy group and work your way upwards. The run leaves from Sandhurst Memorial Park at 6:30pm. Thursday: This week the threshold/improvers run will be on the the Crawley Ridge route. This run is suitable for all abilities and as this run grows in popularity there are even more groups of varying speed to fit with your ability. There is also a shorter route and a sweeper to make sure nobody gets left behind. Meet at Sandhurst Sports Centre at 7:30pm and don’t forget lights and high vis clothing. Friday: No track this week due to Easter. However 26 members have entered the Maidenhead Easter 10 a ten mile event based to the west of Maidenhead. Will regular race marshal PM Theresa May be back this year? Saturday: Lots of members will be action at Parkrun at 9am on Saturday morning. This week Bracknell Stalwart will be celebrating his 100th Parkrun at the Great Hollands venue and there were rumours of chocolate so come along and join him. Don’t forget your barcode!